1. Which of my friends are attending this event? This is probably the #1 question that bugs conference organizers and event attendees. Think of the last time you’ve attended an event or a conference? Your first thought that helped you decide should you spend that extra few hours after work, driving all the way to an event was – are my peers, colleagues or former colleagues gonna be there. Is it gonna make it worth my while? LinkedIn Events you may be interested in does just that as it prioritizes the results showing you just the ones your connections are gonna be at, making it easier for you to decide which ones to RSVP for. 2. Is this event worth my time? Given the time and cost investment associated with events, attendees also wanna make sure that they are making new connections that will prove to be invaluable to them in the long run. Enter, Attendees you may want to meet. This feature is priceless (like People You May Know) as it allows you to connect with these potential contacts you should be networking with. This is something that only a site like LinkedIn can provide using the relationship graph that exists on the site today, friends of friends and all that cool stuff. 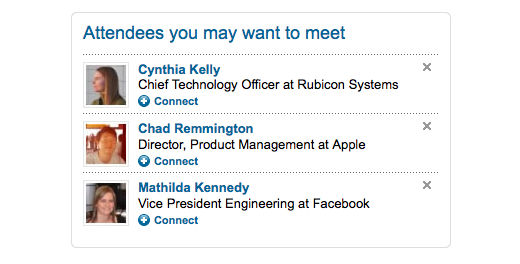 I’d give LinkedIn events a try just for the above two features, but I bet there are other reasons to try it out as well. Let me know what you think about the feature by leaving a comment and I’ll make sure it’s shared with my colleague Jimmy Chen and team. As a critical part of networking, you can now leverage the relationships you’ve built on LinkedIn over the years to inform your experience attending events, making it more productive. 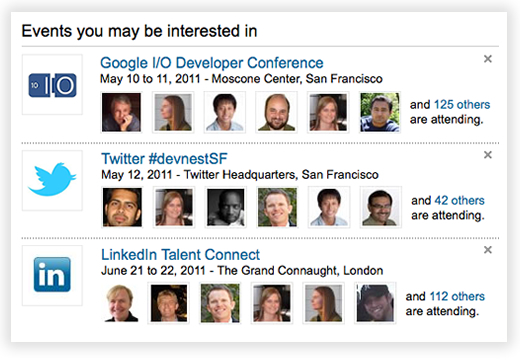 It’s great to see LinkedIn events getting a swift kick in the pants it needed. Knee jerk reaction is it’s still lacking a key feature. I would love to go to the “suggested events page” and see what events my contacts are already going to. Since I am connected to my colleagues, peers, and client, I would like to know what events they are going to, so that I can see whats important to them.